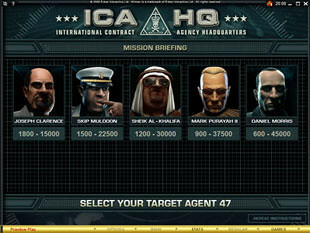 Agent 47 leads your way into the terrific world of killers and spies. 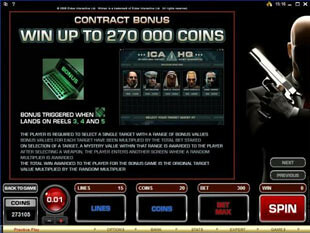 Featured in Hitman slot machine, this marvelous hero is ready to fight to death for your prizes and guarantees you thrilling pastime. 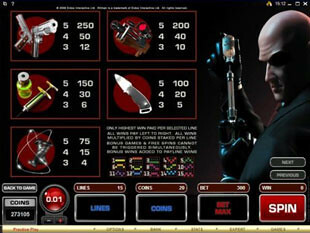 Created in 5 reel 15 payline format by Microgaming, Hitman slot can be played in no download format in any free spins no deposit casino. It means you can forget about installing casino software on your computer. Just click Play button and enjoy the slot game directly through the browser. Hitman armed with two guns is the wild symbol. This merciless guy will substitute for other symbols to provide you with more winning combinations. 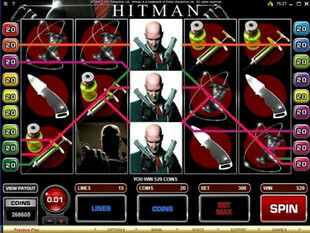 What is more, appearing on the reel 2, 3 or 4, Hitman symbol will expand on the whole reel increasing your chances to win more. Enjoy the sound and catch excitement with this generous fellow. The red ball with number 18 is the scatter symbol. This symbol is vital to trigger Free Spins bonus feature. Just try to catch the necessary combination of these icons to win more. Turn your life around with terrific pastime. To start the show you need to choose some coin size to play with. There are plenty of them ranging from $0.01 to $0.25. Choose any to start playing with up to 20 coins per line. Thus, you have three options that influence your total bet as well as your possible prize – the number of lines to play with, coin size and the number of coins per line. The minimum bet of this game if you want to activate all 15 lines is $0.15. Just choose penny coin size in this case. If you want to play with the maximum option you can stake 20 coins per line and choose $0.25 coin size to play with $75 maximum total bet. Just play with this maximum bet per line to win the top jackpot of 4,000 coins or $20,000. All you need is to collect 5 Sniper Rifles on the payline. All other weapons also will bring you some impressive prizes, but Sniper Rifle does its best. Hitman prepares three bonus games for you. First of all, you can trigger 18 Free Spins during which the prizes won are doubled. Just get three or more scatter symbols on the reels. The next bonus game to catch the excitement is Contract Bonus. You need to get at least three Laptop symbols to activate this bonus feature. All you need is to choose the target among 5 displayed, select a weapon and start hunting. Depending on your choice you will receive Free Spins and multipliers. Play to win up to 270,000 coins. If you get Insignia symbols on the reel 1, 2 and 3 you will activate Insignia Bonus. It is simple to play and win. Just choose one of the Insignia symbols appeared and receive your award. Track your victim with Hitman to find out what real award is. Activate some of bonus games available and enjoy winning your prizes in free spins no deposit uk casino.